Kawara no Sadaijin was a title for Minamoto no Toru (源 融), a statesman and poet who was the grandson of Emperor Saga and a part of the Saga Genji clan. Claimed by some to be the model for the protagonist of The Tale of Genji, the only other really notable claim for Minamoto is this tanka that he wrote, which is also included in the Kokin shu as No. 724. In my notes, it states that the poet saw an intricately print of ferns on cloth, which reminded him of the tangled and chaotic state of his own feelings towards the woman he loved. 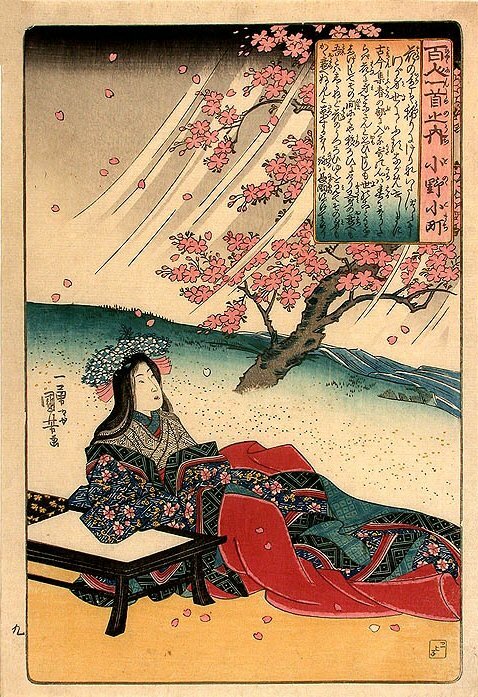 Furthermore, Michinoku (the first line of the tanka) was renowned in Ancient Japan for printed cloth, and Shinobu (the start of the second line of the tanka) was an area within Michinoku, which emphasises how intricate and fine the poet’s emotions would have been. 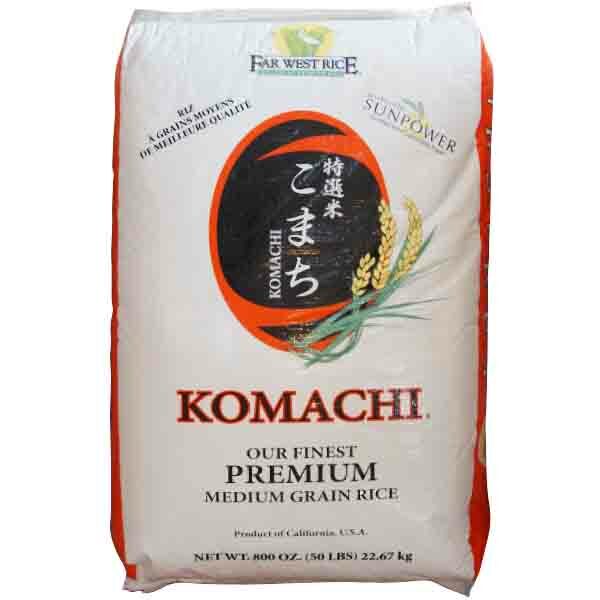 A quick Google search revealed that Michinoku is in fact, the ancient name for Fukushima-shi, in Fukushima prefecture in the Tohoku region of Japan. Although it gained fame (or infamy?) 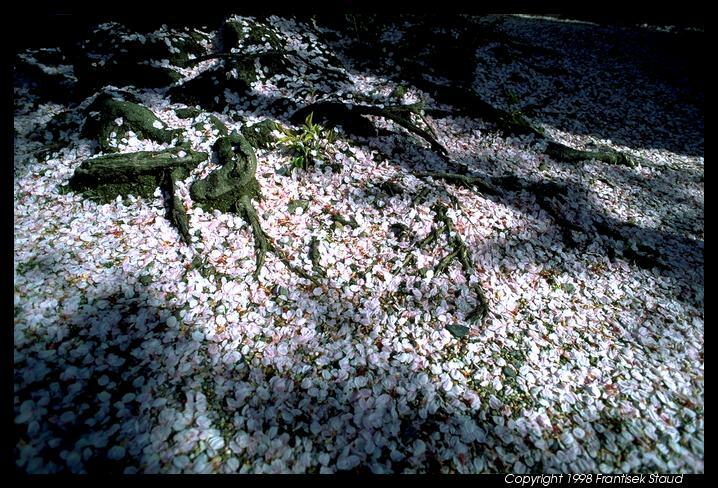 internationally as the site of the 2011 Tohoku earthquake, during the Nara and Heian years, Michinoku was actually a frontier area, and famous for its shinobu mojizuri fabric (the second line of the tanka). The translator also notes that the pronunciation for fern is the same as for remembrance or concealment, which therefore gives the poem the meaning of either concealment through the fabric or the ferns, or remembrance through seeing the cloth or ferns. of Shinobu from the distant north? This alternative translation also shows how Minamoto addresses this poem, as though to entangle his love with him within the fabric. 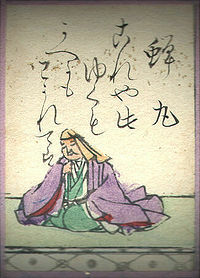 Accompanying notes to this translation additionally shows that this poem has been interpreted as a defense by Minamoto of his faithfulness to his lover, which, due to the interesting choice in imagery to symbolise how upset he is at being doubted, could also be argued as a way of showing a secret love to another. I mean, ‘whose fault is it’ could be both Minamoto reinforcing that it was not his fault that he fell in love with and is in love with his lover and that his feelings for her are as tangled as the prints of Shinobu, or that his heart has, against his will, begun to stir for another, tangling the feelings that he held for his current lover with his emotions for his new interest. I personally like the argument that he is trying to sort through his emotions for another, because it gives the poem more layers, which suits the imagery that he chose with the fabrics and ‘tangle-patterned prints’. It is also amazing that so much meaning can be conveyed within thirty one syllables, and it makes me respect Japanese poetry so much more, because as much as I love poetry, sometimes the way Western poets write seems so excessive and clunky, but here? It is so clean, and so sparse, but still containing so much meaning. And the more I read these poems, the more I realise how lacking my copy of the Hyakunin Isshu is. It is enough to get me started, but it doesn’t provide enough information for my liking, and its translation seems clumsy or lazy compared to alternative translations that I can find on the internet. But maybe I just expect too much from my books. Emperor Youzei was the 57th emperor of Japan, reigning from 876-884. He ascended to the throne early in his life when his father Emperor Seiwa (清和天皇) ceded the throne to his son at eight years of age. As he grew older, Youzei began to display violent tendencies, often executing prisoners himself, and when angered would chase after the offenders, sometimes with his sword drawn. 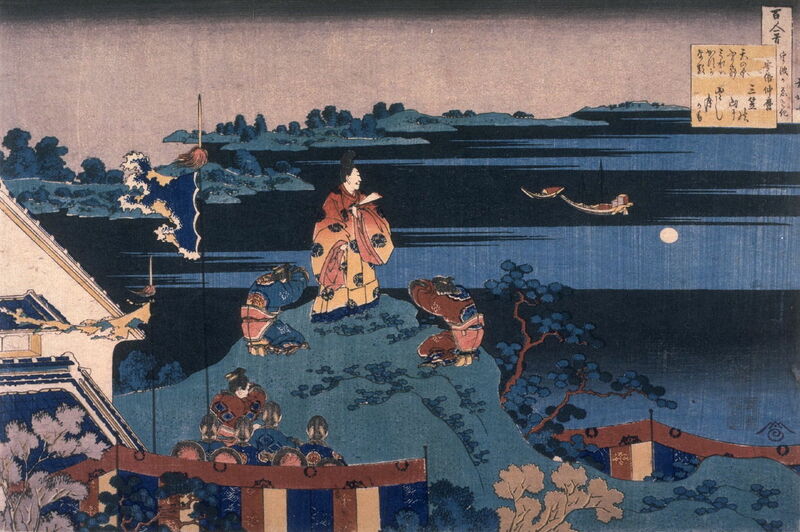 Eventually, his chief assistant Fujiwara no Mototsune realised that Youzei was not fit for rule, and organised a way to take Youzei from his palace and confronted Youzei about his behaviour and announced his dethronement. He was succeeded by his father’s uncle, Emperor Koukou (光孝天皇), and had nine imperial sons after his abdication with seven consorts. Mt. Tsukuba is located in Ibaraki Prefecture, and there is a private train line called the Tsukuba Express that goes from Akihabara in Tokyo to Tsukuba town. The notes in my book remark that, as the source of the Minano River is Mt. 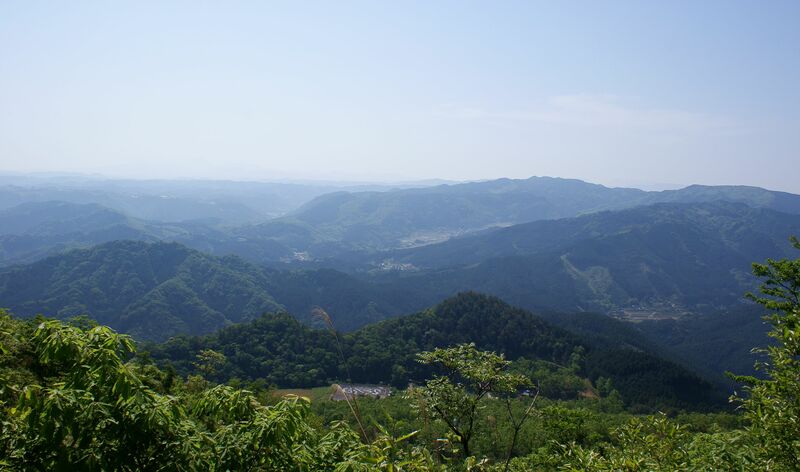 Tsukuba’s twin peaks, which reminded people of a man and a woman, this led to the naming of the Minano river, written as 男女 in kanji and meaning man-woman. Although the poem is describing the scenery at Mt. Tsukuba and Minano River, I feel like the purpose of this tanka is similar to No. 6, which described secret rendezvous between lovers in the night, and No. 10, which talked about meetings at the gate of Osaka. Despite already leaving the palace, as a courtier, his interactions would still have been restricted, and the wording that Youzei uses leads me to think that he had addressed this to one of his consorts about the passion that he felt for her. Even though this was probably not intended by Youzei at all when he penned the tanka, I feel like the emotions that he describes in this poem reveals just how passionate the Japanese people can be. Despite seeming calm, collected, polite, and reserved to strangers and even to their own partners and family members a lot of the time, underneath the smooth façade, the Japanese are just as emotionally charged, if not more so, than their outspoken Western counterparts. This is definitely something that I have realised during my year in Japan as I got to know many more Japanese people, becoming close friends with some of them. And I cannot wait to see more glimpses into these emotions in future tanka, because if they are considered suppressed now, the ancient Japanese would have been hiding their emotions even more strongly, only expressing their true feelings through their imagery and wordplay. Semimaru is only known as a Japanese poet and musician from the early Heian period, with almost nothing concrete known of his life. 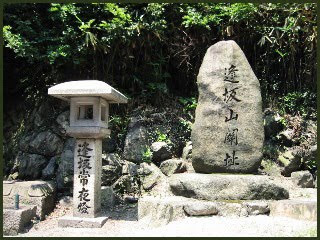 At some point, he became a hermit in a cave at Osaka’s gate, which inspired him to write the tanka above and consequently caused him to be known as the Seki no Akagami (lit. light god of the gate). This particular tanka also appears in the Gosen Wakashu, and some of his other works appear in Shin Kokin Wakashu and Zoku Kokin Wakashu. Also, a note before we get into the interpretation of the tanka: the Osaka (逢坂) that is stated here is not the quite the Osaka (大阪) that is in present day Japan. This Osaka is always mentioned in conjunction with the ‘gate’, and can be read as both ‘oosaka’ or ‘ausaka’ (alt. kanji: 相坂関, 合坂関, 会坂関). I presume that this is the name of a gate that existed in Heian Japan, on the borders of present day Kyoto and Shiga prefecture. I found that ‘to cross the Osaka Gate’ is also a way of expressing a secret meeting between lovers. If you take this meaning into account, then something that seemed to be an observation of daily life becomes an observation of the nature of romantic relationships. People meet and people part, emotions surge and emotions ebb, some relationships continue, and some stall and go no where at all. In addition, the emotional layer that this second interpretation gives fits more into the themes that have been running through the last ten tanka that I’ve looked at. They all deal with something to do with deeper, more abstract topics than just simple observations, and so personally, I agree with this second interpretation more than the widely given, straightforward one. Also, something that I noticed when I was thinking about this tanka was how much more I understood from reading the original Japanese text. It’s been months since I’ve read the last one, and I guess my Japanese has improved enough for me to read more into the actual text without needing the translations. Having said that, this particular tanka is very simple, so maybe that’s why I’m getting it so easy… Let’s see how it goes as I start reading these again. Apart from being a monk, being an accomplished poet, and living near Ujiyama near Kyoto, nothing much is known about Kisen. He was chosen by Ki no Tsurayuki as one of the six poetic sages, whose work was acknowledged to be superior over other poets. However, only two known works can be confidently traced back to him, of which this tanka is one. Personally, I like the reading with ‘Thus’ more (choosing ‘thus’ because it sounds more grammatically correct than ‘but’), because it then shows that Monk Kisen is commentating on the simplicity of his life, with only his hut and his own self to replace the world and its people. And the quiet he captures in those five lines makes me feel peaceful, just by reading it. It makes my once-serious thought of becoming a hermit sound wonderfully attractive again. Abe was descended from a previous emperor, and growing up was applauded for his academics and intelligence. Since he was active during the Nara period, as a smart young man he became part of the mission to China during the Tang dynasty. Somehow or other, he was the only person to stay, and became an official Chinese. He first tried to return to Japan when he received a Japanese employ, but his ship sank not long after leaving China. When he attempted to return to Japan again after several years, his ship was wrecked again. After that, he gave up trying to return to his homeland, instead becoming a high class Chinese official and living the rest of his days in Hanoi (then part of Chinese territory). Abe never really lost his academic prowess, and was a prolific writer and close friend of prominent Chinese poets. However, although he lived quite successfully in his adopted land, Abe never really forgot his homeland, and this tanka is supposedly written at his farewell party before his second departure. 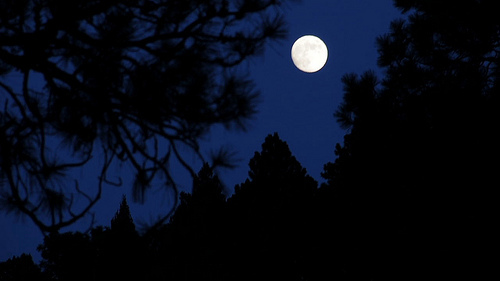 In my notes, this tanka is apparently a reflection of his reminiscing about how he prayed at Kasuga Shrine (a symbol for departure in Japanese classical literature) for a safe trip to China, and seeing the same moon that now hung in the sky before him. The intense longing for Nara, his homeland, the anticipation that he must have felt at finally being able to set homeward bound, the stillness and quietness of the night as it enveloped him in memories. Nothing is quite like home, and the fact that he never really made it back to his beloved Nara is kind of (read: very) heartbreaking. He wanted to stay for a while, and ended up staying forever. For everyone who has been on long long holidays, or lived overseas, or been away from home for extended periods of time, I’m sure there have been times where you just wanted to go home. And I can’t help but think about my own imminent departure for Japan, and the moment that I realise that I’m not quite home, that home is far far away, and I wonder how this tanka will feel then, when I gaze up at the sky at the moon that is shining on the distance that separates my home from me.